Mini tool convenience with the speed of a reversing ratchet. The Ratchet Rocket features a fine tooth ratchet mechanism with reverse lever and thumb wheel for quick rotation and control in tight spots and includes hardened tool steel 2, 3, 4, 5, 6mm hex, #2 Phillips and 25 Torx bits. Ratchet tool snaps into an integrated chain tool and bit storage box. Bought this as an edc ratchet driver for use on my bikes, but also for use in work on my machines, machines use hex bolts on every panel, clamps and retaining fixtures, it is an excellent like ratchet, a great design, as in form (small) and function, as it is very well made have used it if not every day every other day, gets into surprisingly tight places and still has enough length to get leverage to release bolts, added bonus of having a chain break (handy) as I have not seen that on any other device of this size, very happy with this product. Great little toolkit. 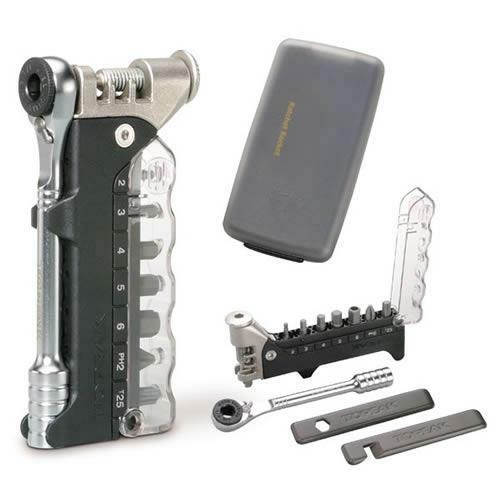 Quite heavy compared to a traditional mini kit but looks well made with useful attachments to place on your bike frame. Love that it has a almost all of my needed tools in a small package, plus I can attach it to the frame. Really handy good quality little tool. Used the first day received and couldn't be happier. Very happy with this. Great wee tool very compact and works well.